Pennsylvania Stoners hero RICH REICE was hardly the first player from Neshaminy High School in the southeastern section of the commonwealth orginally founded by colonial legend William Penn to attain NCAA First Team All-America status in soccer for the PENN STATE NITTANY LIONS. In fact, Penn State’s central midfielder CHRIS BAHR had already received such honors twice (in 1972 and again in 1973) when the curly haired Reice and his high school teammate, MATT BAHR, arrived on the State College campus as freshmen and joined the Nittany Lions’ varsity squad under new head coach WALTER BAHR in 1974. Chris, whose older brother Casey Bahr had been named Third Team All-America (’68 & ’69) at the U.S. Naval Academy and later made three appearances for the United States squad at the 1972 Summer Olympic Games hosted by the West German city of Munich, started scoring goals at a serious clip from the very moment he first slipped on the Penn State shirt. As a freshman in 1971, Chris Bahr scored 12 goals in 11 games before the Nittany Lions were hammered 8-0 by Howard University at the quarterfinal stage of the annual NCAA tournament. Over the course of the next two seasons, Bahr netted a combined total of 21 goals (while also dishing out 12 assists) in 24 games for Penn State while earning back-to-back First Team All-America selections. 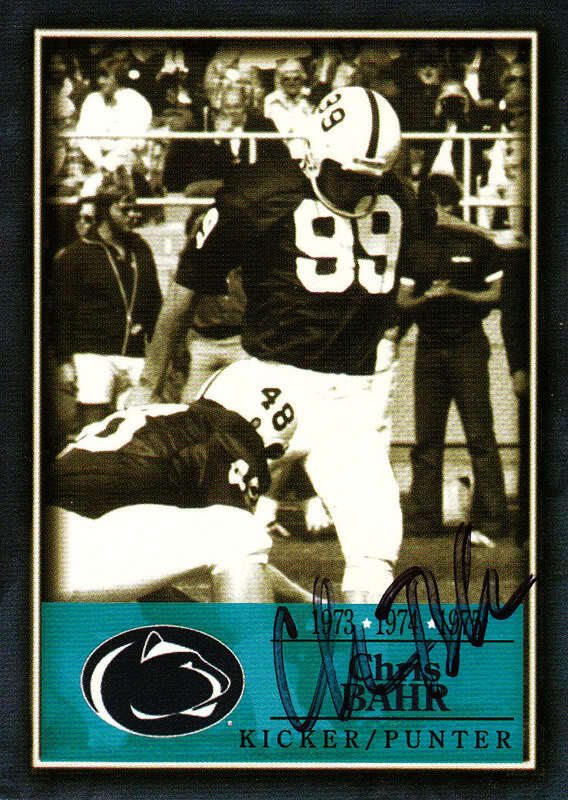 In 1973, while netting 11 goals in 12 games as a junior for the soccer team, Bahr also earned his first varsity letter in football for Penn State by simultaneously booting field goals (with ‘sophomore’ eligibility) for Joe Paterno’s gridiron team. The Nittany Lions, featuring Heisman Trophy winner John Cappelletti at tailback, ultimately ended the season with an unblemished 12-0-0 record and the number five ranking in the Associated Press final poll after defeating Louisiana State University 16-9 in the 1974 Orange Bowl. Penn State had fallen behind 7-0 to the Tigers early in the first quarter on that occasion, but it was the soccer All-America who began the Nittany Lions comeback by immediately booming a 44-yard field goal for what was then an Orange Bowl Game record. Now joined by his father Walter, the new head coach for the Nittany Lions now having departed Philadelphia’s Temple University, and freshman brother Matt in Happy Valley, Chris Bahr would complete his own unique hat trick in the fall of 1974 by becoming the very first three-time NCAA First Team All-America in Penn State soccer history. With the Neshaminy Scoring Connection accounting for almost sixty percent of the team’s goals, Penn State finished its first regular season under Walter Bahr with an undefeated record of eight wins and three times. Operating at the heart of the Nittany Lions’ 4-3-3 formation, the senior Chris notched another 12 goals and four assists in 1974 and set new school records for career assists and points along the way. Out on the wing, the talented Reice concluded his freshman term as the second-leading scorer for P.S.U. with six goals while the youngest Bahr brother, deployed as an outside midfielder in his first collegiate season, ended up right behind on the chart with five goals. 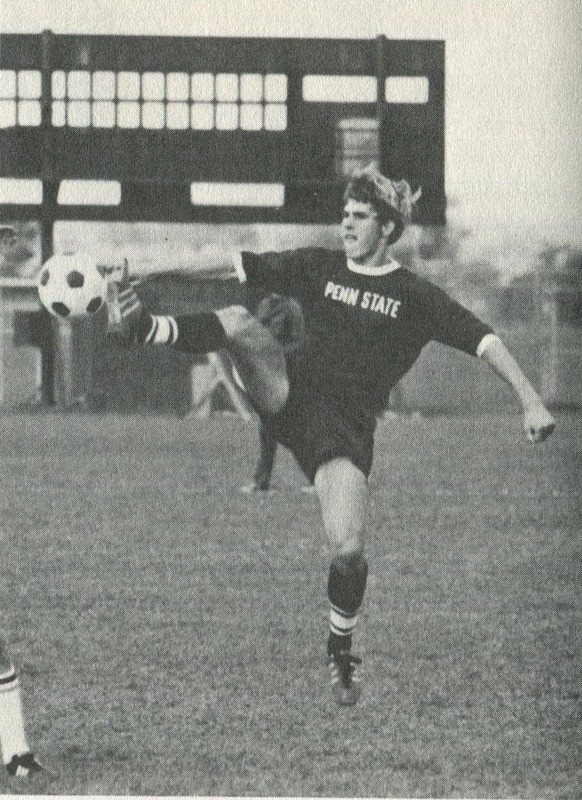 Despite a strong team which included NSCAA all-region and NCAA honorable mention (third team) All-America selection RANDY GARBER, the Abington High School product who later spent four seasons in the old North American Soccer League with the Tampa Bay Rowdies, Los Angeles Aztecs and Washington Diplomats, the Nittany Lions were knocked out of the 1974 NCAA tournament at the first hurdle when intra-state foe Bucknell University defeated Penn State 1-0 in State College. Undaunted, the versatile Chris Bahr continued to kick a new school record number of three-pointers for Joe Pa’s gridders as a junior on Penn State team that went 10-2 and finished with the # 7 ranking in the annual Associated Press poll. 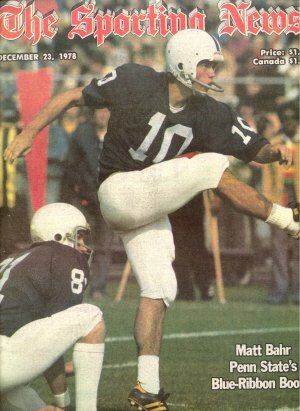 Bahr contributed two field goals as the Nittany Lions pulled off a remarkable second half rally to trounce Baylor University 41-20 in the 1975 Cotton Bowl on New Year’s Day and then, later that spring, took advantage of a new NCAA rule which allowed him to sign with the professional Philadelphia Atoms of the old North American Soccer League but still save his last season of football eligibility. Bahr went on to score 11 goals in 22 games as a midfielder for the Atoms that summer and was named the 1975 NASL Rookie of the Year. The prolific attacking midfielder CHRIS BAHR registered 45 goals and 22 assists in 48 games for the Nittany Lions to conclude his highly successful soccer career as the all-time leading scorer in Penn State history … Nowadays, 112 points still ranks the Neshaminy High School graduate as fourth on the all-time scoring list in State College although no Nittany Lion has been able to equal Bahr’s impressive feat of three NCAA First Team All-America selections in soccer while at Penn State. Those interested in more details on the NCAA field goal kicking exploits of both CHRIS and MATT BAHR might try “JOE PA’s BEST BAHR NONE” here. 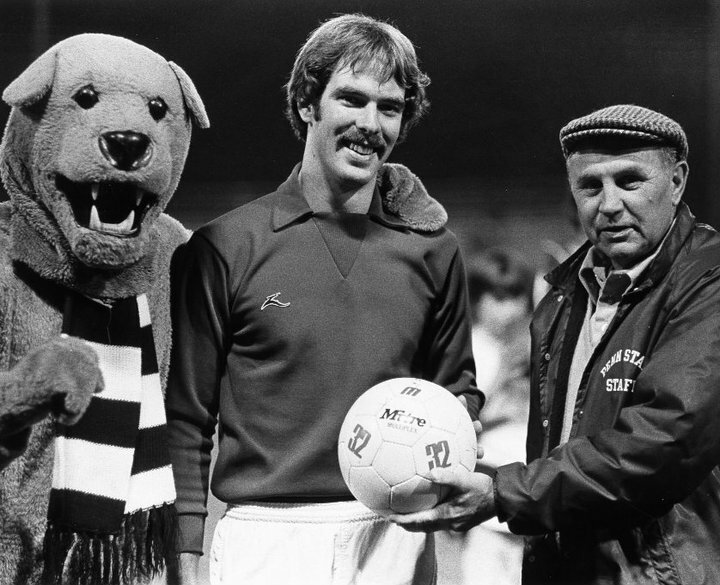 The Nittany Lion mascot and head coach WALTER BAHR celebrate with DAN GALLAGHER, a three-year starter from St. Anthony’s High School in Smithtown, New York, after the senior Penn State goalkeeper re-wrote the school record for career shutouts in 1978. 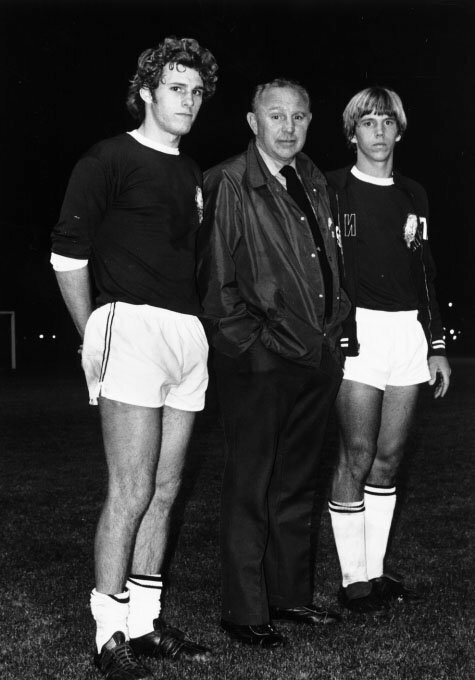 Philadelphia native WALTER BAHR had exactly four years of collegiate coaching experience under his belt upon leaving Temple University in the City of Brotherly Love to take control of the PENN STATE UNIVERSITY men’s soccer team in 1974. But, almost a quarter century earlier, it had been this very same man who had provided the glorious pass that led to the only goal of the game as the United States toppled mighty England 1-0 at the 1950 FIFA World Cup final tournament in Brazil for what will always remain one of the most incredible upsets in all of sports history. A respected defender who had represented the United States at the 1948 Summer Olympic Games in London and was described by journalist TOMMY MUIRHEAD, the former Glasgow Rangers forward who earned eight international caps during his career, as “good enough to play for any First Division team in the United Kingdom” in an article published by the Glasgow Daily Mail while the Scotland national team was visiting on tour in 1949. Upon arriving at the field lying in the shadow of the ever-expanding and now world-renowned Beaver Stadium, Bahr immediately established the Nittany Lions soccer program as a legitimate regional powerhouse. At the very same time that legendary coach Joe Paterno was establishing the Penn State football team as a perennial title contender on the national stage, the school’s soccer team was busying qualifying itself for nine consecutive NCAA tournament appearances to coincide with Bahr’s first nine seasons at the helm in Happy Valley. Ultimately, this great leader of young men took a dozen different teams to the annual NCAA tournament in only fourteen seasons while developing many All-America and future professional players alike. In an era when many other powerful schools simply could not resist the temptation to actively recruit outstanding foreign talent, Bahr never wavered in his particular belief of American exceptionalism and actually set up a little pipeline that flowed from the noteworthy Shimano youth team program based in eastern Pennsylvania. The products of that fruitful connection would include Bethlehem’s very own JIM STAMATIS from Liberty High School, the 1979 Hermann Trophy winner as the nation’s standout collegiate soccer player who ranks as Penn State’s all-time leading scorer still to this day. One prominent player coming out of the greater Philadelphia metropolitan area was RICH REICE, the talented Neshaminy High School graduate who was selected First Team All-America for Penn State in 1977 and later, after starting his professional career with the hometown Philadelphia Fury in the North American Soccer League, shot the game-winning goal for the Pennsylvania Stoners in the 1980 American Soccer League playoff final. 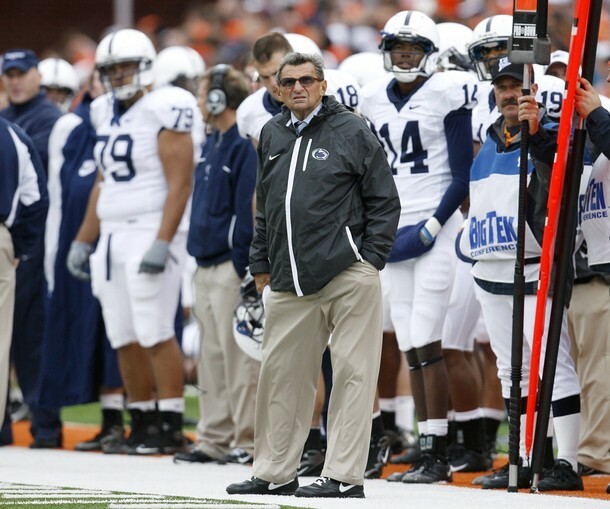 If God’s favorite gridiron football team is NOT Penn State … then WHY is the sky BLUE and WHITE??!! … Rest In Peace from all the haters, JOE PATERNO, they realize they broke your heart and ruthlessly killed you … On behalf of ALL in the Commonwealth of Pennsylvania, a heartfelt thank you so very, very much for EVERYTHING. Legendary gridiron football coach JOE PATERNO and the PENN STATE UNIVERSITY program featured the luxury of outstanding field goal kicking all throughout the 1970s thanks, indirectly, to the Philadelphia native who had played such a pivotal role in the famous 1-0 victory by the United States over mighty England at the 1950 FIFA World Cup. It had been, of course, future Penn State varsity soccer coach WALTER BAHR who provided the historic ball for JOE GAETJENS to head past England goalkeeper BERT “The Cat” WILLIAMS of Wolverhampton Wanderers and score what remains one of the most famous strikes in the history of the globe’s most glamorous tournament. 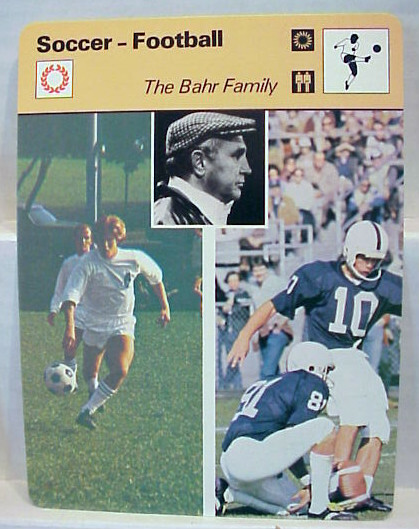 Bahr’s eldest son, Casey, became an All-American at the United States Naval Academy and also was chosen for the 1972 U.S. Olympic soccer team that competed at the ill-fated Munich Games in West Germany. In 1974, the former World Cup defender took over the soccer program in Happy Valley and would lead the Nittany Lions to the prestigous NCAA tournament an impressive twelve times in fourteen years on the job. Bahr’s two youngest sons, Chris and Matt, both played under him at Penn State and also achieved All-American status in soccer as had their older brother while also both gaining further notoriety and additional All-American recognition as field goal kickers for the iconic Paterno. CHRIS BAHR (99) had already been named All-American three times at Penn State before concluding an outstanding rookie season as an attacking midfielder for the Philadelphia Atoms during the 1975 North American Soccer League season. Chris then returned to Happy Valley for a final campaign under the beloved Joe Pa while serving as both placekicker and punter for the 1975 Penn State football team that went 9-3 and ranked # 10 in both the Associated Press and Coaches Polls after losing in the Sugar Bowl to the legendary Paul “Bear” Bryant’s University of Alabama squad. 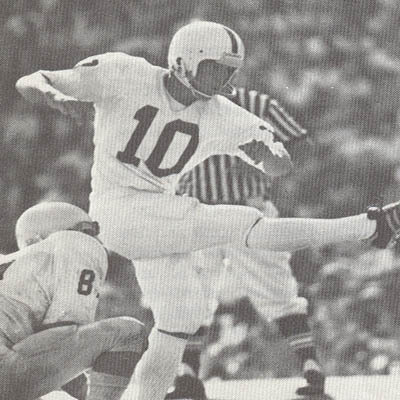 In an era when the “soccer-style” kicker was still something of a novelty, Bahr boomed four field goals of over 50 yards and set a new NCAA record for field goal percentage in his All-American senior season for the Nittany Lion gridders. 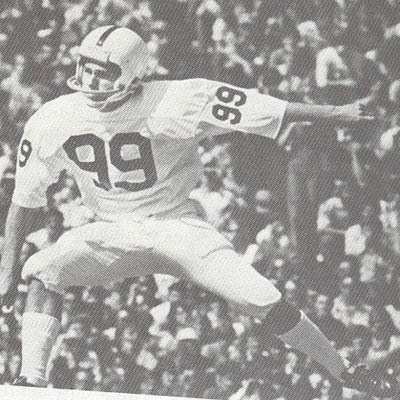 The versatile CHRIS BAHR (99) would be selected from Penn State University by the Cincinnati Bengals in the 2nd round of the 1976 National Football League Draft, an incredibly high pick for a placekicker even by today’s standards. The Bengals had enjoyed the excellent work of former West German professional soccer player Horst Muehlmann for five years but the one-time Schalke 04 Gelsenkirchen goalkeeper had gone to the Philadelphia Eagles in 1975. Bahr did not disappoint in Cincinnati and quickly attained All-Pro status at the NFL level over the course of a long career which included stints with the Oakland / Los Angeles Raiders and the San Diego Chargers. MATT BAHR (10) took over for his older brother, Chris, as the placekicker for Penn State gridiron football team and also attained All-American status in his senior season under Joe Paterno. Bahr broke his older brother’s NCAA record by making 22 of 27 field goals for an 81.5% accuracy rating and was a genuine weapon for a Penn State team which ended the regular season a perfect 11-0 before losing, once again, to the University of Alabama in the Sugar Bowl. This famous defeat cost the Nittany Lions the coveted national championship but did not prevent Bahr from being selected by the Pittsburgh Steelers in the 6th round of the 1979 National Football League Draft. MATT BAHR (10) had followed his two elder brothers, Casey and Chris, into the ranks of professional soccer and spent most of the 1978 North American Soccer League season with the forgettable Colorado Caribous before closing out the campaign with the old Tulsa Roughnecks. After his senior season kicking field goals for Penn State, the youngest Bahr signed on to bolster the backline of the fledgling Pennsylvania Stoners in the American Soccer League. In late July of 1979, the two-sport defender left Allentown School District Stadium in the Lehigh Valley and reported to his first NFL training camp with the Pittsburgh Steelers, who went on to defeat the Los Angeles Rams in the Super Bowl that season and were crowned league champions.